Delicious Verona! With its beautiful ancient palaces and the enchanting countryside seen from a distance from practicable paths and solid galleries with balustrades..., this is how Charles Dickens, the famous British author of Oliver Twist, wrote in the 19th century, when during his visit to Verona he thought he could hear the "ancient and quiet streets in which the cries of the Montecchi and Capuleti echoed...? 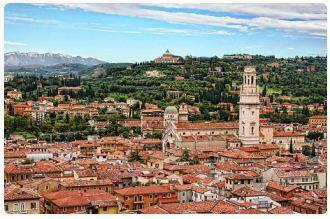 The marble churches, the high towers, the rich architecture remind us that Verona is one of the most beautiful and historically charged Italian cities. 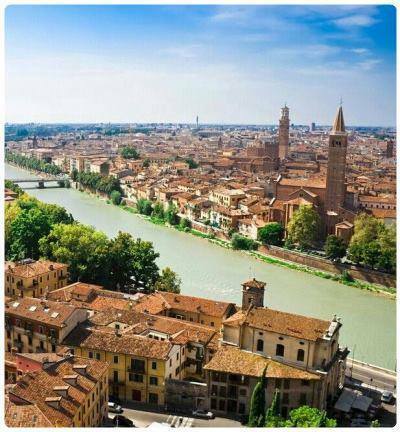 Many of us know it as the city of lovers, the place where Shakespeare set the most famous romantic drama of all time, Romeo and Juliet. But this is also a city that offers itself to the visitor for many other interesting and suggestive facets. 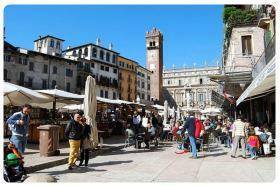 Verona is a busy and lively city, a place where past and future are the constant thought of a daily life full of enthusiasm. A place known since ancient times, chosen by the Romans for its fertile plain, for its being halfway between the lakes and the Alps, the north and central Italy, a crossroads of peoples and travelers. Gothic memories and medieval legends are lost in the maze of narrow streets and seventeenth-century palaces in the center, flanked by the city's landmarks, the Roman Amphitheater and Juliet's Balcony. 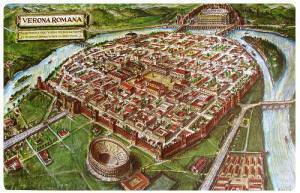 The ancient Romans chose the fertile outlet of the Adige river as their settlement place, and settled here, in a place that stood on the main road of communication of Europe that was forming with their conquests. It was the first century of a new era and the city was born between Lake Garda on the one hand and the Pre-Alps on the other. 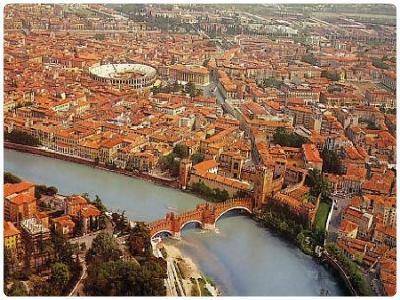 To say that Verona was born with the Romans is not entirely correct, however, in earlier times the territory was in fact already inhabited by several indigenous peoples such as the Euganeans, the Cenomani Gauls or the ancient Venetians (also called Paleoveneti). Let's close our eyes on a summer night... imagine the notes in the air that come from the shows of the Arena of Verona, one of the most important places of music in Italy and a monument known throughout the world. The Roman Arena can be easily reached from Piazza Bra, a very lively meeting point in the city center and recognizable for the high Civic Tower of the Lamberti and the seventeenth-century architecture of the Palace of the Grand Guard (Palazzo della Gran Guardia - keep an eye on the art exhibitions inside). 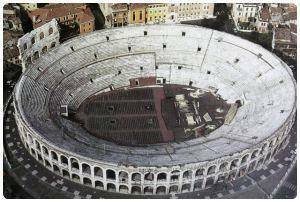 The Arena di Verona is the best preserved Roman Amphitheatre in the world and the best known along with the Colosseum of Rome, one of those places that a foreign tourist can not help but visit once in Italy, one of those places that every Italian wants to see at least once in his life. Despite its 2000 years, the barbarian incursions, the earthquake of the twelfth century, wars and more recent battles, still continues to testify to the greatness of the Romans and the welfare of the Veronese. In Verona, the power struggles in the Middle Ages led to a series of rivalries that ended, at the end of 1200, with the rise of the family of della Scala (also known as Scaligeri). 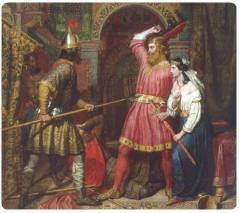 The family became the lady of Verona in 1262, with Mastino della Scala, of Ghibelline tradition. He with his strange name "Mastino", was not the only one to testify a certain sympathy with the 'canine' theme of the wealthy family; among his successors there was also Cangrande, with whom the city lived its most flourishing period, and to whom Dante dedicated a whole song of his Divine Comedy, and also Cansignorio, to whom we owe the construction of important city monuments. The power of the Scaligeri family was such that their rule extended to nearby cities such as Belluno, Padua, Treviso and Vincenza. Al penultimo dei signori della città (Cansignorio, come accennavamo prima) si devono strutture monumentali come la Torre del Gardello (la prima torre orologio in Italia), il ponte sull'Adige, e la commissione delle cosiddette "Arche Scaligere", le famose tombe monumentali della famiglia della Scala, situate nella piazza esterna alla chiesa di Santa Maria Antica. Le tombe, come diceva lo scrittore francese Paul de Musset, sono "un'opera rara, che segna il passaggio dal Medioevo al Rinascimento", un'architettura ed un'arte scultorea unica in Italia. La più elaborata delle tombe è quella di Cangrande I: un sarcofago sostenuto da dei cani (il tema 'canino' continua), accompagnato da una Pietà, dall'Annunciata e dall'Angelo Annunciante e riccamente decorato da bassorilievi. Il tutto custodito all'interno di un baldacchino ad arco, con in cima la statua del valoroso condottiero a cavallo in battaglia. Le tombe scaligere sono in totale cinque e ancora oggi rappresentano uno degli esempi più belli d'arte gotica in Europa; accanto a quella di Cangrande I troviamo anche quelle, più semplici, di Mastino II, Cansignorio, Alberto II della Scala e Giovanni della Scala. The penultimate of the city's lords (Cansignorio, as we mentioned before) was responsible for monumental structures such as the Tower of Gardello (the first clock tower in Italy), the bridge over the Adige, and the commission of the so-called "Arche Scaligere", the famous monumental tombs of the Scala family, located in the square outside the Church of Santa Maria Antica. The tombs, as the French writer Paul de Musset said, are "a rare work, marking the transition from the Middle Ages to the Renaissance", an architecture and sculptural art unique in Italy. The most elaborate of the tombs is that of Cangrande I: a sarcophagus supported by dogs (the 'canine' theme continues), accompanied by a Pietà, the Annunciata and the Angelo Annunciante and richly decorated with bas-reliefs. All this is kept inside an arched canopy, with the statue of the valiant leader on horseback in battle at the top. There are a total of five Scaliger tombs and they still represent one of the most beautiful examples of Gothic art in Europe; next to Cangrande I there are also the simplest tombs of Mastino II, Cansignorio, Alberto II della Scala and Giovanni della Scala. Gli Scaligeri appartenevano alla Verona delle Signorie, ma non c'è dubbio che la Verona storica più nota sia quella del periodo dei Comuni e cioè del periodo delle lotte per le investiture tra Guelfi e Ghibellini, questi ultimi ben rappresentati dalla famiglia dei Montecchi, probabilmente una delle famiglie medievali più conosciute al mondo. Pensate che il turismo a Verona riguarda ancora oggi la famiglia dei Montecchi, con quelli che possiamo definire i pellegrini 'shakespeariani', coloro che arrivano in città esplorando le strade un tempo testimoni delle lotte tra la famiglia dei Capuleti e la famiglia dei Montecchi, famiglie di appartenenza di Romeo e Giulietta. Malgrado la storia verosimile, i personaggi della tragedia di Shakespeare in realtà non sono mai esistiti, e allora che dire della Casa di Giulietta in via Capello a Verona? 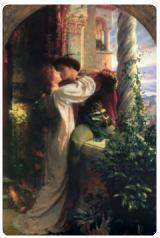 And that romantic balcony from which the beautiful Juliet looked out? 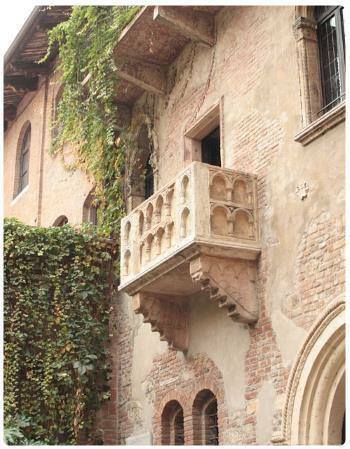 The balcony is a beautiful fake, added to the original building in 1935, but the suggestion remains and it is difficult to go to Verona and not imagine the two lovers fighting for their love. What is true is only the story of the two powerful families of the city, two rival noble families in the Italy of the Municipalities. As is well known, the story of Romeo and Juliet in Verona is based on an ancient legend that inspired the great English novelist Shakespeare told in two novels, a Sienese novel of 1476 and a Venetian novel by Luigi da Porto, of 1524, entitled 'Historia novellamente ritrovata di due nobili amanti'. Luigi da Porto was the first to set the story in the Verona of the Scaligers, telling the story of the two protagonists, Romeus and Juliet, a young couple. A few years later, Shakespeare reworked the original novel, transforming it into a work of art that everyone knows. "Juliet's sarcophagus, simple, open, with withered leaves around, in the vast and desolate garden of a convent, is as sad as her love was sad. I took away some pieces to give to my daughter and grandchildren". So wrote Byron when he visited Verona. In this case it is clear that the power of the literary myth has imposed itself on what is inferred from the real historical documentation. 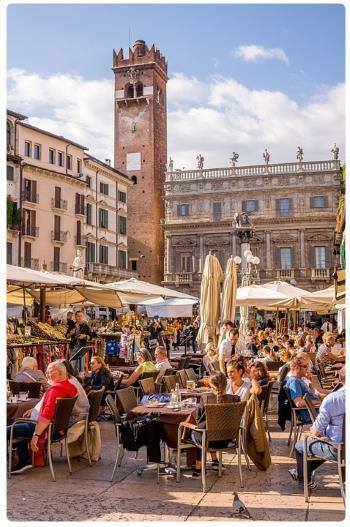 But Verona is a city for dreamers, you know, and even today the tourists who come to be photographed under the legendary balcony are well over a million each year. The small, simple courtyard of Via Cappello is filled with young and old, many leave behind a photo, a memory of a day of lost love. Someone is involved in the tradition of touching the right breast of the beautiful bronze statue in the courtyard (the Juliet by Nero Costantini). From here, if you want to get close to the river bank, in Via delle Pontiere, a few minutes walk, you will also find the tomb of Juliet and then see the pretty cloister of the Capuchin convent of San Francesco al Corso, the place where he traced the tragic fate of the two lovers. "During the evening you feel the joy of living and the aristocracy goes out for the walk. Those who go to church to recite the Ave Maria, those who stop in Piazza Bei Cavalleri approach the carriages to entertain themselves with the beautiful ladies. The population here comes and goes among the greatest entertainment and especially in some streets. In the days of the market the squares are full of people, you laugh, you joke throughout the day. The people are all beautiful and good and look after the events of others with a keen eye, the rich and noble are locked up in their homes." Johann Wolfgang von Goethe. Thanks to this Goethe pass, you can easily get carried away with your imagination to the places described and to the joyful and noisy atmosphere of the market. Imagine the Piazza delle Erbe as it was then, admire the patrician palaces that surround it. The herbs, spices, coffee beans and light silks that once arrived in the city, through Venice, from the distant Catai visited and told by Marco Polo, still seem to echo with their scents and flavors in the frame of this small square. The Maffei Palace, the Merchants' House, the Mazzanti Houses, all recall the historical eras experienced by the city over time. Of particular interest, a little further on, is the Loggia del Consiglio, built during the Venetian rule in Verona. From here you can easily reach the beautiful Church of Santa Maria Antica and its Arche Scaligere. Not far away, we find the Church of Sant'Anastasia in Verona, which is appreciated for its Dominican Gothic architecture of the late thirteenth century (note in particular the fresco of St. George del Pisanello). 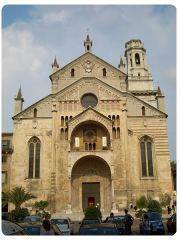 The churches of Verona find a particular space in the artistic and architectural context of the city. First of all, the Cathedral of Verona (Cathedral of Santa Maria Matricolare), with the main portal embellished with bas-reliefs in Lombard Romanesque style and the white and pink marble attributed to Maestro Niccolò (XII century), whose work can also be seen at the Basilica of San Zeno Maggiore. This last church is indicated by art critics as a masterpiece of Romanesque in Italy, a building originally built in the eighth century on the foundations of the tomb of St. Zeno, patron saint of Verona. The church, although located a little outside the usual tourist route, for its beauty and harmony, is still the most visited in the city. On the sober external façade, admire the great 12th century rose window, called the Wheel of Fortune, which says: "Behold, only I, Fortune, govern mortals; I raise, lay, give to all goods and evils; I dress who is naked, I strip who is dressed. If anyone trusts me, they will mock them." Note also the main portal, surmounted by two pillars with marble lions. Inside the religious building there is an important painting by Andrea Mantegna. 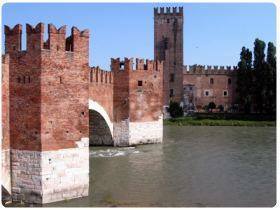 Going up the Adige, towards the city centre, you reach Castelvecchio, the Castle of San Martino in Aquaro, a fairytale fortress, embattled with towers and brick turrets. It was commissioned in 1354 by Cangrande II to serve as a residential palace and military fortress; it survived centuries of occupation by the Visconti family, the Serenissima Republic of Venice and Napoleon, before being destroyed in World War II. After a long restoration in the 50s, by Carlo Scarpa, it was opened to the public in 1964. 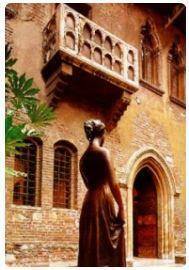 Inside the structure there is now the Civic Museum of Castelvecchio, one of the most important museums in Verona. 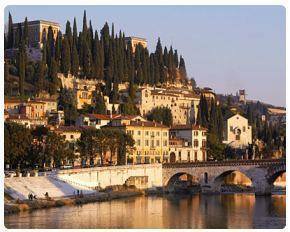 Verona is a pleasant city and full of opportunities for fun and cultural events. Above all, important events and exhibitions are not to be missed throughout the year, such as the Arena Opera Festival, which since 1913 has delighted the evenings of opera lovers, the Veronese Summer Theatre and the various representations of the Shakespearean Festival. The poet Valerio Catullo, born in 84 BC.